Welcome to your Mitsubishi dealership and we are proud to announce we have new owners and a brand-new attitude, but still with the same car-buying experience that is second to none. The Morgan Auto Group is our new family. They say, "When You Make It Morgan We Make It Happen." At Brandon Mitsubishi, we adopted this philosophy. So we'll make it happen. Car-buying should be a fun and stress-free experience. With us, you get no-hassle, no-fuss transparent low market price with no hidden fees, no gimmicks, no tricks and no pressure. The sticker price you see is what you pay. Our sales staff wants nothing more than help you find the right car for you at the right price. And if it's not here, the Morgan Auto Group has more than 30 dealerships representing more than 20 brands. If you want it, we'll make it happen! Our finance experts will help you navigate through the paper process and answer any question you may have. If you don't understand every aspect of it, the deal won't be finalized; no surprises and no selling you a vehicle you cannot afford. This is an important investment and one that must be protected. Our state-of-the-art service department will ensure your vehicle is always in tip-top shape. Our factory-trained technicians will treat your vehicle as if it were their own and only use original parts, unlike retail chains and corner shops. No one knows your vehicle better than our experts. And during your brief visit, relax in total comfort in our lounge. Enjoy complimentary snacks and beverages. We're in your corner every step of the way. 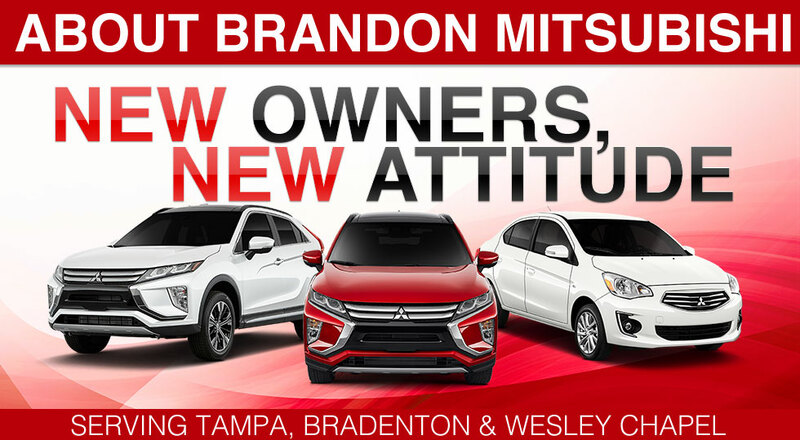 Come experience our new attitude at Brandon Mitsubishi. Visit us at 9915 Adamo Drive in Tampa and drive home in the new Mitsubishi you've always wanted!